VOLK vehicles transport the baggage of millions of passengers at airports around the globe each year. Needless to say, quite a few of these passengers are prominent figures. For a celebrity to fly in on their own airplane is not exactly unusual. However, for them to arrive on one of the largest private jets in the world is quite unusual for us, even though we are actually experts when it comes to big birds. 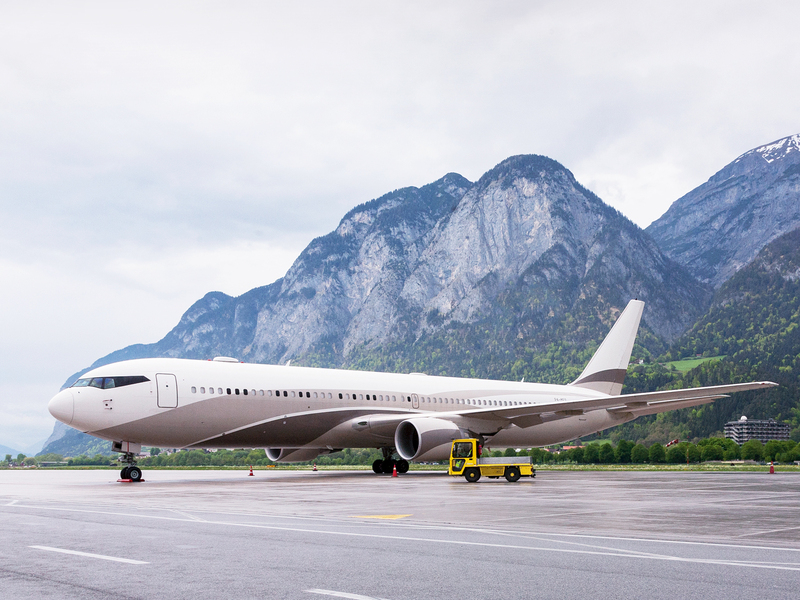 The Russian billionaire Roman Abramovich is a frequent visitor with his private Boeing 767 at Innsbruck Airport. The airplane registered as P4-MES is a re-modeled airliner which originally accommodated 350 passengers. While normal passengers have to squeeze through narrow aisles to get to their seats and can barely stretch their legs during the flight, the Abramovich jet has a spacious lounge, several offices and a large, two-floor bedroom. Of course the plane is also equipped with bathrooms with showers and sinks. The only thing that was not installed was a Jacuzzi tub because it is practically impossible to manage large bodies of water during certain flight maneuvers and particularly during takeoff and landing. It may comfort some mere mortals hastily finishing their last cigarette before boarding to know that fire prevention is given top priority even aboard a private jet, and therefore it is impossible to install a fireplace above the clouds even for a packet of money. Apart from these minor restrictions, the luxurious interior furnishings of the VIP jet leave practically nothing to be desired, and we may assume it is possible to manage even very long flights pleasantly and restfully in this manner. The anti-missile system, also a part of the extensive equipment of the jet, shows however that life may be more comfortable but not necessarily less complicated with a growing bank balance. This might also explain why the Russian oil tycoon appreciates the tranquility and seclusion of the Austrian Alps so much and therefore enjoys short vacations in Tirol regularly. 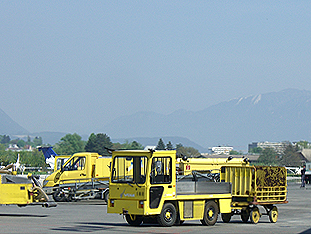 When the aircraft lands at Innsbruck Airport, a VOLK DFW 3 Diesel Platform Truck is always waiting to transport the baggage of Abramovich’s large entourage to the terminal building. The DFW 3 vehicles are especially designed for use at regional and smaller medium-haul airports and therefore optimally meet the requirements at Innsbruck Airport.